When I told everyone I was doing a half marathon walk they didn’t see what the big deal was. I know I wasn’t running it so why was it such a big thing? Okay, I didn’t technically need to do much training, but it was still kind of a big deal. Plus we were doing it for such a good cause too, Cancer Research has always had a special place in my heart as they do some truly inspiring work. The Shine walk in particular is a massive operation which takes around 10 months to organise – and it shows, from start to finish it’s an amazingly slick operation. We’d been asked to be part of Team Sole – which not only meant we had buddies to walk with but also some support for our feet – 13.1 miles ain’t going to be easy on the feet. We started in the 8.30pm team and gave ourselves 4 hours to make it round. Some other members of the team wanted to do it in 2 hours 45 – I loved their positivity, but without any training I was happy for them to steam ahead of us. And as we started I realised the enormity of what was ahead of us – the longest I’d ever walked for was around 2 hours and that was only because I was at a bootcamp I had someone telling me to do it! 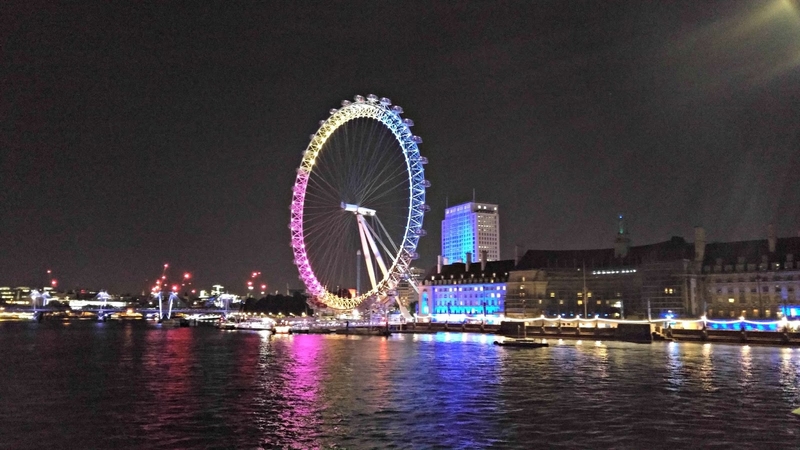 But we reached the first mile with ease and slowly some great London landmarks came up – including Tower Bridge and the eye – which both looked amazing at night. As we got to mile 5 we had our first pit stop, but quickly moved on – somewhere between mile 4 and 5 our competitive streaks had come out, we didn’t want it affecting our final time – such fitness geeks! By mile 8 we were officially power walkers, powering through the crowds and finding gaps where we could overtake the slower among us. 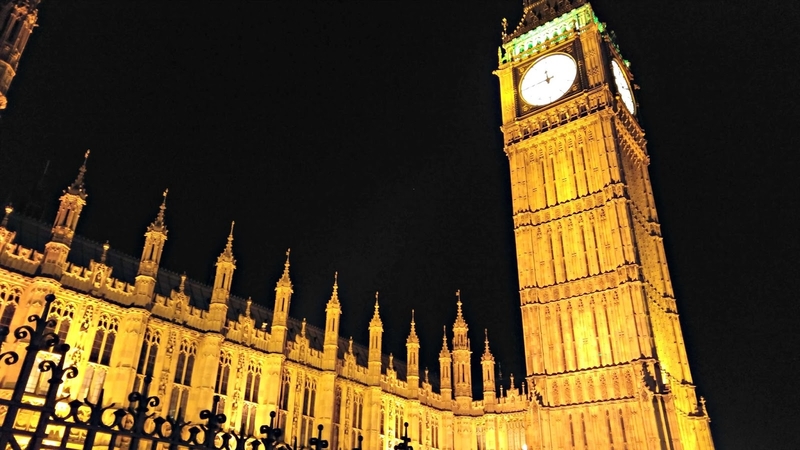 And the funny thing about walking the streets of London that late at night is the people piling out of the pubs – drunk and heading for dirty burgers. One drunk reveller even said to us ‘you guys are just sooooooo athletic’ – yes we were, we were walking, just like she was! By mile 10, and lots of power walking my legs were getting sore, so I was happy to see another pit stop and get our snacks! That was another great thing about the walk – they kept you fully hydrated and we’re constantly handing you out little treats – I think I put on more calories than I lost that night! Then finally 3.1 miles later, as we saw the end in sight I was, in all honestly, happy to stop walking – it was 12.30am and I was ready for bed. I was of course totally in awe of the full marathon walkers, they had started an hour behind us, so most of them wouldn’t be finished until early morning! It really was a great experience and I’d probably do it again, and recommend anyone thinking of doing it next year to sign up now! 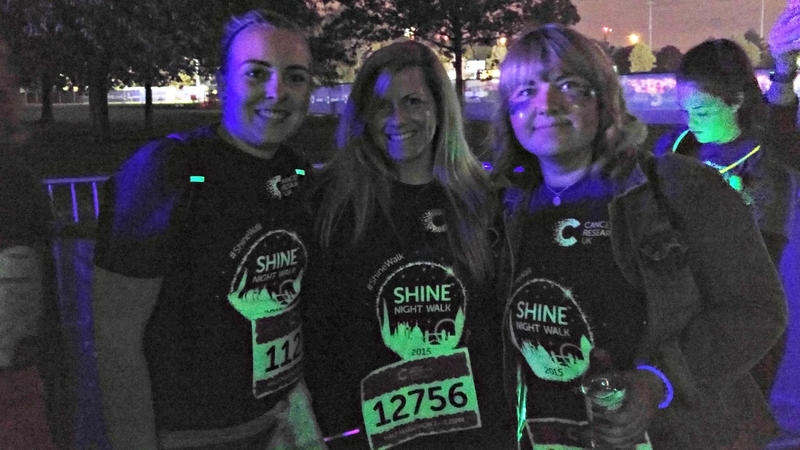 I also loved being part of Team Sole – it made the night even more fun and my feet didn’t hurt at all the next day. 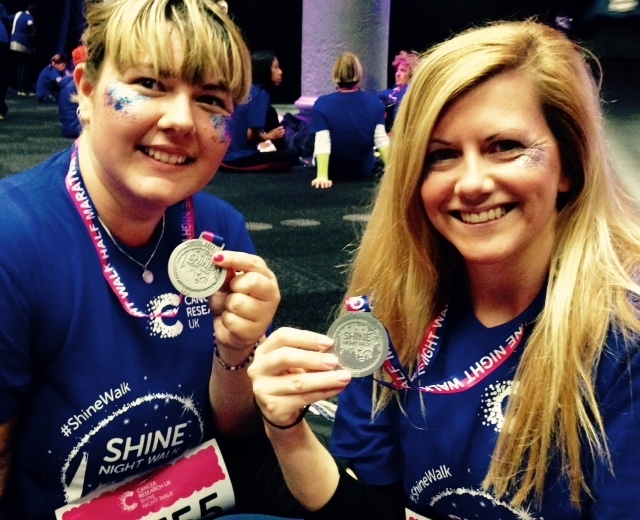 If you want to sign up for next years Shine Walk you can register here. Good luck! Thanks to Beki from Fitness blog Miss Wheezy for the photos.